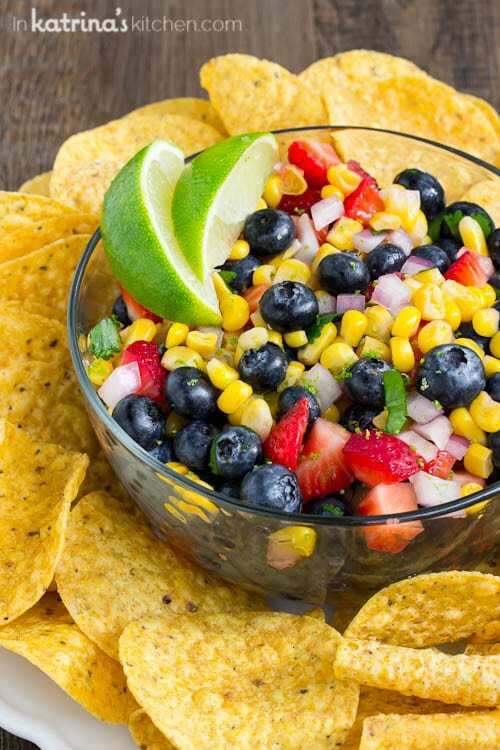 Sweet and fruity with just the right amount of heat, your’re going to love switching things up with this show-stopping Blueberry Corn Salsa! Today I’m sharing with you this fabulous Blueberry Corn Salsa Recipe because I just recently spent time with Iowa Corn at #IACornQuest and I was inspired to go home and get cooking with corn! Well, technically this isn’t cooking. In fact you can throw this together in about 10 minutes and everyone will be hitting you up for the recipe! So don’t bring this if you’re an introvert and don’t want to be giving out the recipe all night. The lineup here is super simple and the flavors come together so beautifully. It’s fresh and sweet with just the right amount of heat. Up until this past week temperatures here in Ohio were still toasty warm. I took this salsa to a potluck dinner at our church and it was a big hit. As I said I was inspired by all of the sweet and savory corn recipes on my recent trip to Iowa with some other fabulous bloggers. There’s nothing like being with your peers in the food writing industry to really get your creative juices flowing. Certainly the talented and committed farmers energized us as well! 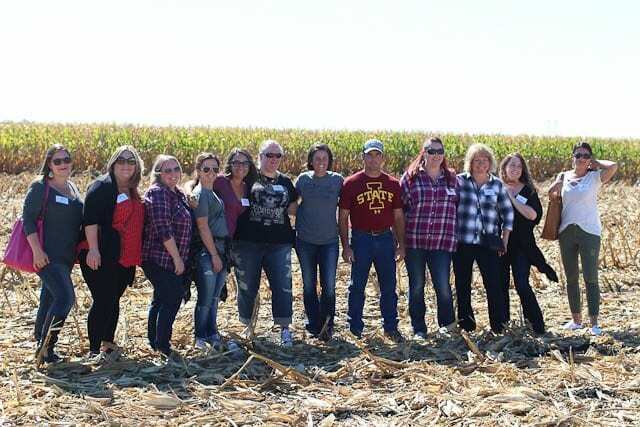 Everyone was so welcoming; I hope you read about my short time in the great state of Iowa! Don’t you just want to reach in there and grab a corn chip and get snacking? Don’t skimp on the squeeze of fresh lime and a bit of lime zest. Add some coarse salt and a few turns of the pepper mill and you have yourself an irresistible snack (or dinner if you are me!). 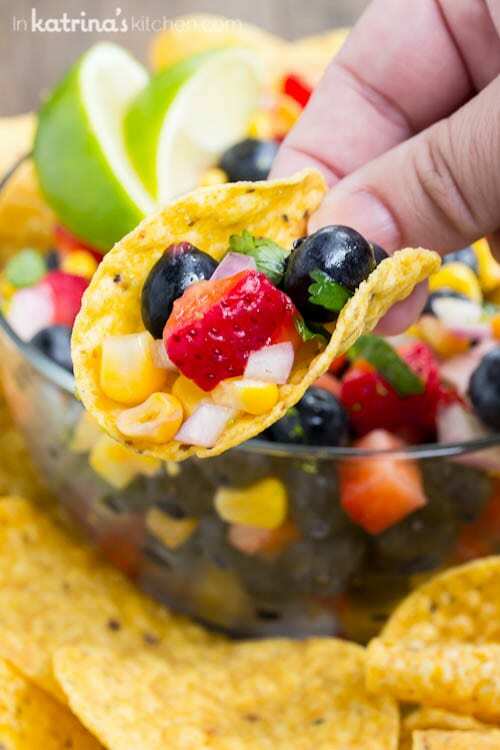 Sweet and fruity with just the right amount of heat, your're going to love switching things up with this show-stopping Blueberry Corn Salsa! 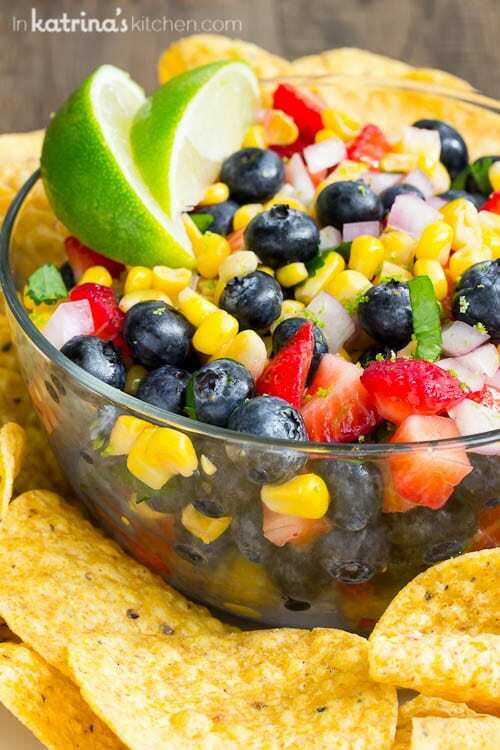 In a large bowl combine corn and blueberries. Sprinkle strawberries with sugar and place in bowl. Stir in the red onion, cilantro. Toss with lime juice and lime zest. Salt and pepper to taste. Serve with corn chips. Store in the refrigerator up to 3 days. I enjoyed partnering with Iowa Corn to bring you this recipe. 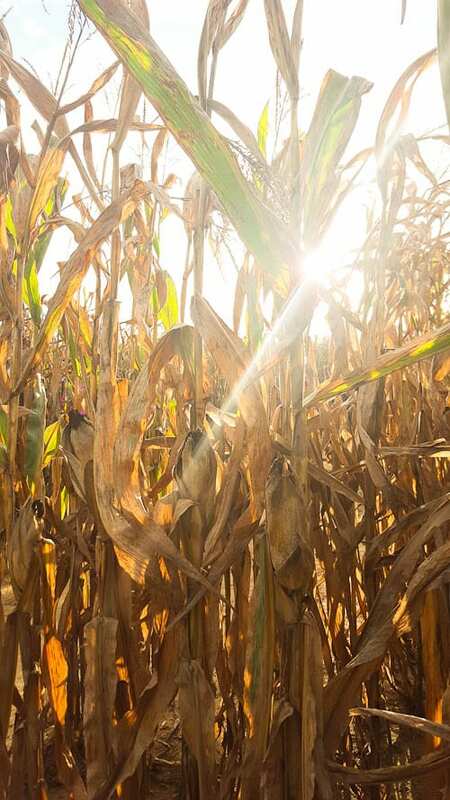 You can connect with Iowa Corn on Facebook, and Twitter. As always, all opinions expressed are my own. Feeling hungry? Here are some more delicious corn recipes to get you started! Pressure Cooker Creamed Corn by Kleinworth and Co. This would be perfect for a party! 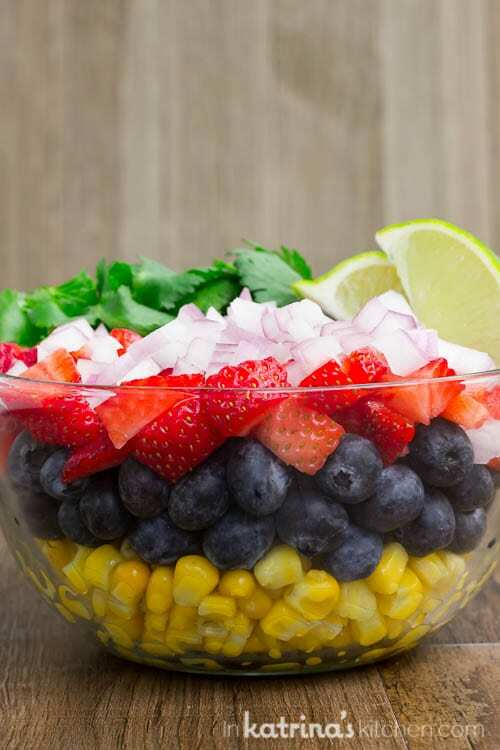 I love how colorful it is and that corn and blueberry combo is great. I love this idea!! I bet this would be fantastic over some grilled chicken, too. Mmm. The perfect snack or party dish!! Love the colors! I love a creative take on salsa! This sounds beyond amazing! Can’t wait to make it! what an innovative salsa, love it and thank you! Hi Katrina…. !your salsa looks amazing and so yummy. well i love your idea. Thanks for sharing…! Hi katrinas….! 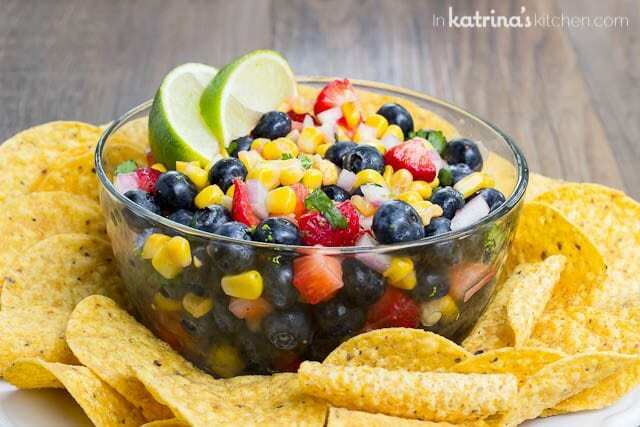 this is one of my favorite recipe and your blueberry corn salsa looks soooo good and beautiful….! Thanks for sharing….! This looks really good and easy to make I love it. Such a change from plain old salsa too. Have you ever tried mango salsa or watermelon? Both are good too. Can I make this tonight, at 9 PM and server tomorrow at 1 PM? Or should I make it tomorrow morning?